Wow, the title of today’s post is a long one, right? There’s just so much goodness happening today that I had a hard time deciding which recipes to include and which not to… so I just included all three. I was a recipe making machine yesterday afternoon and for good reason, too. Despite Kevin and I consuming 2 apples a day, we’ve barely made a dent in the collection of apples we picked the weekend before last. 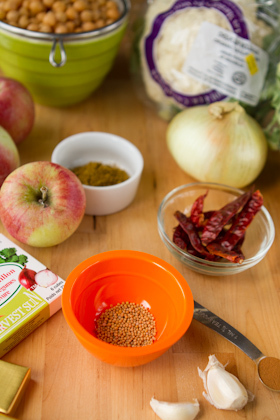 I was a bit skeptical of adding apples to a curry-inspired recipe but hey, why not? The result was blog-worthy, as Kevin calls it when he taste tests something and smiles from ear to ear. For serious though, this recipe rocks the casbah. 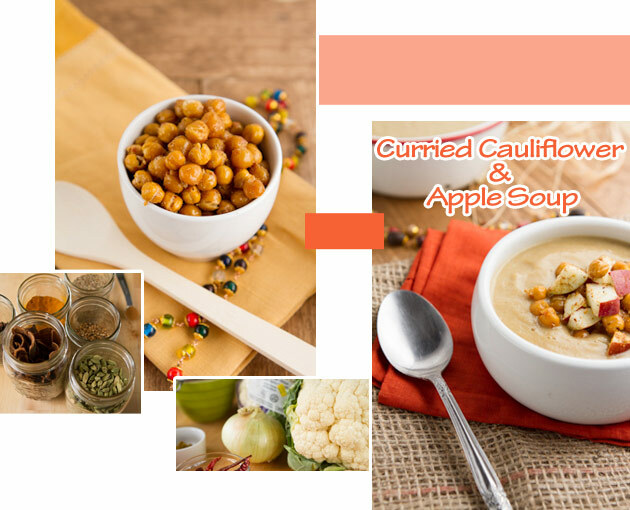 The apples make it sweet, the cauliflower makes it ridiculously creamy, it’s just a tad-bit spicy, and has bold curry flavor. 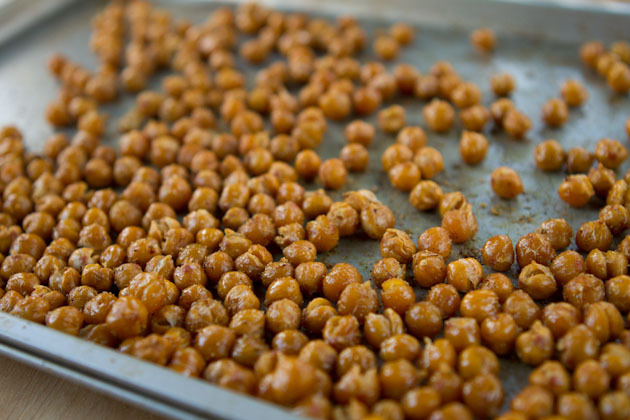 Top it all off with some crunchy roasted chickpeas and you have a meal fit for any blustery afternoon… and we’ve been having a lot of those lately. 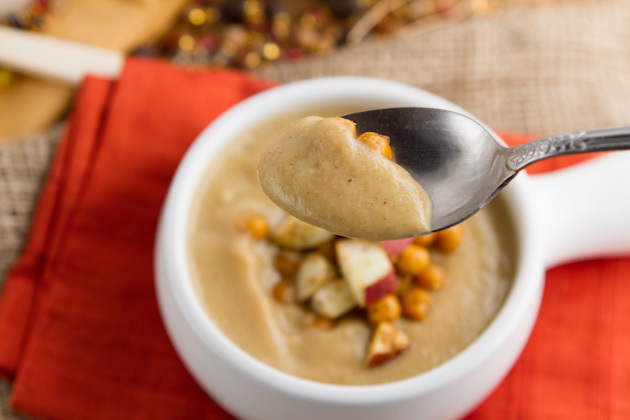 Curried vegan soup made creamy with pureed cauliflower, made sweet with fresh apples and topped off with crunchy chickpeas. Heat oil in a large saucepan on medium heat. Add chopped onion and garlic. Cook for approximately 4 minutes, until soft and rotate frequently. Add curry powder, ginger and cinnamon. Continue cooking for another 1 minute. Add remaining ingredients. Cover and bring to a boil. Reduce heat to low and simmer for 20 minutes. 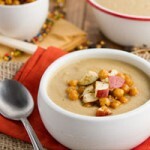 Remove from heat and puree using an inversion blender, food processor or blender. 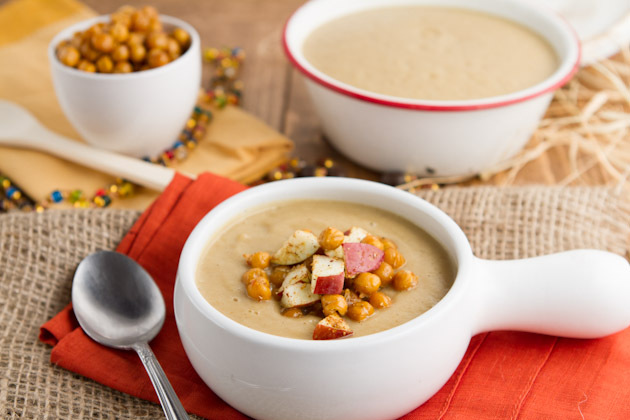 Serve hot with optional topping of Curried Chickpeas (recipe below) and a couple of pieces of apples coated with a pinch of curry powder. Kevin and I made our weekly visit to Tau Market in Dorval this past weekend and found the most amazing (and cheap) organic, local cauliflowers! 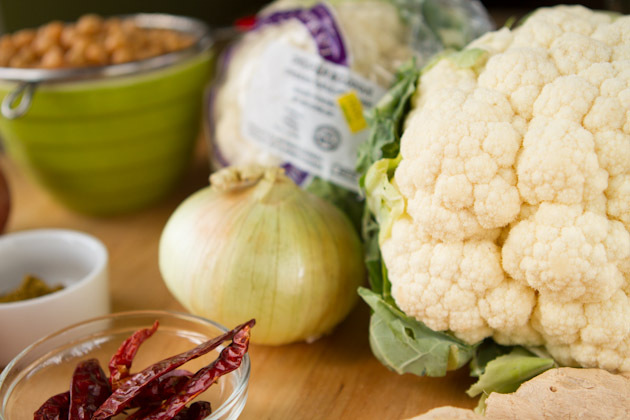 Just $1.39 per cauliflower… and they were ginormous! I’m sure you know the trick to peeling a garlic clove quickly and easily, but I had to share in hopes that maybe just one of you haven’t tried it this way! You place the garlic clove underneath a big/fat knife and press on the knife gently. All you need is to crush the clove, just a bit. Remove the knife and lift off the garlic shell. Once your garlic and onions are roughly chopped, add them to a large saucepan with the oil and saute until soft. Add the spices and cook for a bit longer. Add the remaining ingredients, cover and bring to a boil. Then, reduce heat to low and simmer. Oh yes, and the curry powder is homemade! I’ve been unable to have curry powder for as long as I remember. I break out into hives and suffer from an incredibly horrible reaction when I eat it. The curry powder in India didn’t do it, but every single brand that I’ve tested at home or at a restaurant yields the same result. I think it has something to do with my allergy to peanuts and the mixtures having spices that may be related to the legume family. Heh, whatever the reason, now I have a solution – make my own and be done with it! The best solution out there if you ask me! 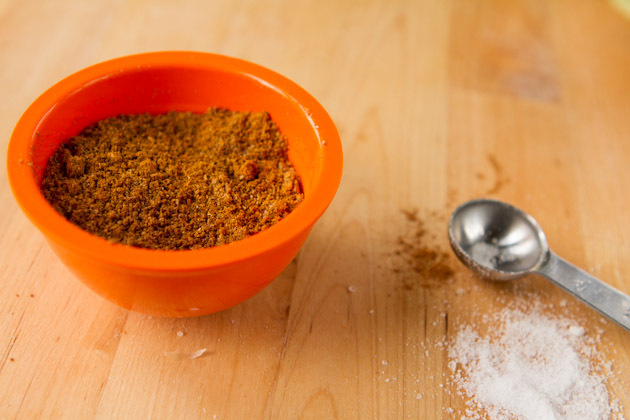 homemade curry powder that's completely allergen-free! Add coriander, cumin and mustard seeds to a small cast iron frying pan. Toast on medium heat for 2-3 minutes until golden. Continue to shake the pan to prevent from burning. Drop into the cup of your coffee grinder and add cinnamon bark and cloves. Grind until powdered. Add powdered mixture and remaining ingredients into a small bowl. Mix with a small spoon. I really enjoy making my own spice mixtures and this curry powder was no different. 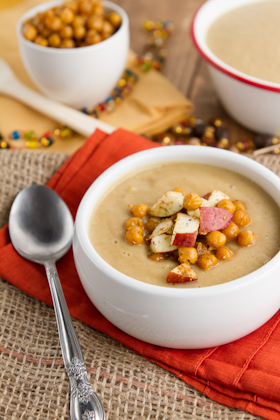 Not only does the mix go great in a soup like this one, but you can also add it to popcorn with a bit of coconut oil… mmmm. Toasting the spices are important. Make sure you don’t skip this step! And while the chickpeas are cooking, you can have fun cleaning everything up! 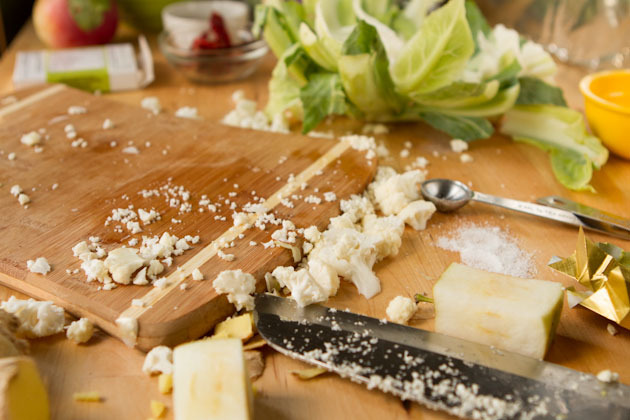 Cauliflower makes quite the mess, doesn’t it?